24 By faith Moses, when he had grown up, refused to be known as the son of Pharaoh’s daughter.25 He chose to be mistreated along with the people of God rather than to enjoy the fleeting pleasures of sin. 26 He regarded disgrace for the sake of Christ as of greater value than the treasures of Egypt, because he was looking ahead to his reward. 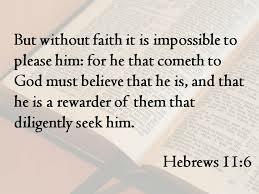 27 By faith he left Egypt, not fearing the king’s anger; he persevered because he saw him who is invisible. 28 By faith he kept the Passover and the application of blood, so that the destroyer of the firstborn would not touch the firstborn of Israel. 32 And what more shall I say? I do not have time to tell about Gideon, Barak, Samson and Jephthah,about David and Samuel and the prophets, 33 who through faith conquered kingdoms, administered justice, and gained what was promised; who shut the mouths of lions, 34 quenched the fury of the flames, and escaped the edge of the sword; whose weakness was turned to strength; and who became powerful in battle and routed foreign armies. 35 Women received back their dead, raised to life again. There were others who were tortured, refusing to be released so that they might gain an even better resurrection. 36 Some faced jeers and flogging, and even chains and imprisonment.37 They were put to death by stoning;[e] they were sawed in two; they were killed by the sword. They went about in sheepskins and goatskins, destitute, persecuted and mistreated— 38 the world was not worthy of them. They wandered in deserts and mountains, living in caves and in holes in the ground.